Lorna M. (Bisek) Moen, age 95, of Minneapolis, MN, and formerly of Lowry, MN, died Saturday, August 11, 2018, at Catholic Eldercare in Minneapolis. A Mass of Christian Burial will be held at 11:00 A.M. on Friday, August 17th, at St. John Nepomuk Catholic Church (Reno Church), rural Lowry, with Fr. Bob Kieffer officiating. Visitation will be at the church, one hour prior to the service. Interment will be in the parish cemetery. Arrangements are with Hoplin-Hitchcock Funeral Home of Glenwood. Lorna Mary Moen, the daughter of Frank and Antonia (Bosek) Bisek was born August 25, 1922 in Lowry, Minnesota. Lorna grew up in Lowry and attended St. John Nepomuk Catholic Church. She attended school in Lowry and graduated from Glenwood High School. After high school, Lorna moved to Minneapolis where she worked at Benson Optical. Lorna had two children, Gregory and Susan. She raised her family in Minneapolis, but came home to Lowry often to spend time with her extended family. 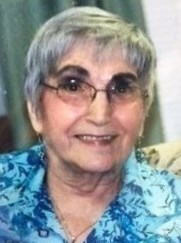 She was a member of the Lowry American Legion Auxiliary. Lorna enjoyed ceramics, making Rosary’s and cooking. She will be remembered for her bright smile, her quick wit and endless love, no matter what. She was known for raising heck and had a way of bringing joy and laughter to those she loved. Lorna is survived by her son, Gregory (Diane) Moen of Spring Lake Park, MN; grandchildren: Sasha Moen, Sawyer Moen, Joseph Stucynski, Louis Severson, Joseph Severson, Brian Knutsen and Jennifer Knutsen. She is also survived by Brynn Kowalczyk, Joanne Knutsen, Stephen Stucynski, Jack and Cappy. Lorna was preceded in death by her parents; daughter, Susan Stucynski and brother, Laurence Bisek.